“In Saudi Arabia, gold coins have always been important in the monetary system. For years, in fact, paper money was unacceptable, and to pay royalties to the government, Aramco once flew kegs of both gold and silver coins to jiddah. In 1952, when the Saudi Arabian Monetary Agency (SAMA) was formed, the first coin issued was a Saudi sovereign – a gold coin equal in weight and value to the British sovereign – that was later demonetized and today sells for about $124. To collectors, however, the most interesting Saudi gold coins weren’t coins at all; they were “gold discs” Similar to coins, they were minted by the Philadelphia Mint in the 1940’s for Aramco, and bore, on one side, the U.S. Eagle and the legend “U.S. Mint, Philadelphia, USA” and, on the other side, three lines on the fineness and weight. They looked like coins, they were used as coins, but, technically, they weren’t coins. In the 1950’s, numismatists were puzzled by these “discs” until - in 1957 – the story emerged in The Numismatist. 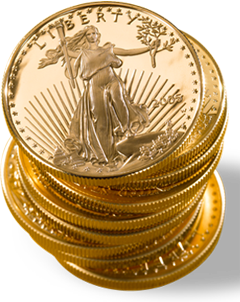 Aramco, required to pay royalties and other payments in gold to the Saudi government, could not obtain the gold at the monetary price fixed by the United States so the U.S. government specifically began to mint the “discs” – actually bullion in coin form for these payments. In 1945, for example, the mint turned out 91,210 large discs worth $20, and, in 1947, 121,364 small discs worth $5, according to The Numismatist. Gold coins made by the U.S. to help oil companies pay their debts to the Saudis. Sometimes coins are minted for the strangest of reasons. Some Saudi Arabian bullion coins, several of which will be auctioned by Stack's early next month, are a prime example. The coins were struck in Philadelphia by the United States Mint in 1945 and 1947 to satisfy the obligations of the Arabian American Oil Company, or Aramco, which had been set up in Saudi Arabia by four American oil companies. The company was obliged to pay the Saudi Government $3 million a year in oil royalties and its contract specified that the payment be made in gold. The United States dollar at the time was governed by a gold standard that, at least officially, made the dollar worth one thirty-fifth of an ounce of gold. But the price of gold on the open market had skyrocketed during World War II. For a time the Saudis accepted payment in United States currency, but by 1945 they were insisting that the payments in gold be resumed. Aramco sought help from the United States Government. 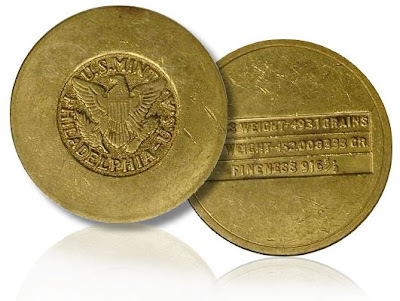 Faced with the prospect of either a cutoff of substantial amounts of Middle Eastern oil or a huge increase in the price of Saudi crude, the Government minted 91,120 large gold disks adorned with the American eagle and the words "U.S. Mint -- Philadelphia." Aramco paid for the minting and the bullion. The coins were shipped off to Saudi Arabia. These bullion coins weighed 493.1 grains, slightly more than a troy ounce, and were 91 2/3 percent gold and 8 1/3 percent copper. The fineness was that of the British sterling system then current in the Middle East. The United States standard was only 90 percent gold. Although some Aramco employees reported seeing the coins in circulation in the late 1940's, even using them as poker chips, the coins were not widely circulated. Islamic law discourages images and most Saudi coins are adorned with only Arabic script as decoration. The eagle with its wings spread wide must have been a startling sight to Saudi Arabia's more orthodox Muslims. But most of the coins disappeared for more temporal reasons. The bullion coins were crated and shipped to Bombay, where the $35-an-ounce American gold was sold for $70 an ounce. Most of the coins were melted into bars and later sold in Macao. In 1947, Aramco contracted for 121,364 smaller bullion coins with the same design, but weighing just 123.27 grains. Those coins actually saw some popular use in Saudi Arabia and traded for about $12, or 40 silver Saudi riyals. But the popularity declined after Swiss and Lebanese counterfeiters began striking coins that were similar but less valuable. In 1951, Saudi Arabia began minting its own gold coins and melted down most of the remaining small and large bullion coins from the United States Mint, restriking them as Saudi coins. Today both sizes of the Aramco bullion coins are quite rare and many counterfeits are in circulation. The genuine large disks have fine lines in and around all the letters; the counterfeits have small dots. Counterfeit small disks often show a large indentation above the M in Mint. Did you also read this? I added the link and the full article to the post. Btw, the story on the Aremco coins is indeed quite huge in my opinion. More evidence for the thesis of A/FOA plus I was not aware that Saudi had been demanding gold from what seems like the very beginning (first oil discovery in Bahrain was in '32). This seems to indicate that the Saudi's did not even trust the internationally gold-backed dollar. This article is from 1969. Quite nice seeing those Saudi/gold-related articles pop up. Quite the essence of the writings of A/FOA/FOFOA. The influence Islam is also interesting and quite relevant: In those days the government's role in the economy was based on the Islamic dictum that "things Exchanged shall be of equal value." "Money" meant coins made of metals having intrinsic values equal (as far as possible) to the exchange values of the coins. We've seen some lectures on it here in the past (I have no particular sympathy for the political ideas of the speaker, but his monetary insights are interesting). Gresham seems to have lived there as well: When the world price of silver rose so high that the value of metal contained in the riyals exceeded the official exchange value of the riyal, they were equally quick to exchange gold and other currencies for silver riyals, then melt the riyals and sell them as bullion to silver brokers. At such times, silver riyals disappeared from circulation. Gold was indeed money and currency: The Saudi Government believed that the only proper way to meet the increased demand for money was to put more gold and silver coins into circulation. Accordingly, for a two-year period beginning in 1948, Aramco paid its oil revenues in foreign gold coins which were packed in kegs and flown to Jiddah every month. Again money should be money according to Islam, and hence of equal value - Riba (interest; multiplying) is haram (not allowed by god). Perhaps this partly explains their "passion" for gold and monetary insight to a certain extend. All I was trying to say is that Bernanke's printing press is riba and hence haram, as is the interest the Western world inherently charges on its money. A fascinating find! It feels as if the tesserae are all slotting into place. I am not surprised that the Saudis did not trust the dollar even when it was gold-backed. This attitude is consistent with "The past ideals of building solid, enduring, long term wealth" as written by "Another" and quoted by FOFOA (http://fofoa.blogspot.com/2010/03/of-currency-wars.html). I empathize with that attitude, which I have fully taken on board. Once the light is seen, there is no going back. Paper is paper and gold is gold -- even when one appears to be backed by the other. When a layer of paper is interposed between gold and its owner, the intermediary has the opportunity to manipulate and deceive. The Saudis knew it even back then, precisely because they were still very much in touch with the concept of "solid, enduring, long term wealth." The source of that attitude is somewhat speculative (and perhaps not a topic for this site), but they knew it alright. The funny thing is that they had not experienced much of the industrial revolution (which has been a huge wealth improver) prior to the discovery of oil, and hence did not seem (at least not to me, although not being very familiar with the country) too focused on building wealth. On the other hand the middle-east at some point has been the most advanced society in the world and also seems to have been the origin of the agricultural revolution many thousands of years ago. I was not trying to promote the quran or islam in any sense, but the focus on money and riba did strike me as perhaps being somewhat relevant. Bottom line is that the Saudi's did understand the value of gold over printable paper - although when used to transfer knowledge the latter can be quite valuable as well. ...No, the 800-pound gorilla is far closer to home for most members of OPEC: It's Iraq. ...It would be quite a change from the near hegemony that Saudi Arabia enjoys within OPEC today. For decades, Saudi Arabia has served as the world's central banker of oil supplies. save the system and keep the world away from Euros. It will not work. Could the Iraqi oil stretch the dollar's lifespan? This passage is part of the law, and the essence of the passage is repeated a couple more times in the Torah and, I presume, repeated again in the Quran. Thus, my interpretation is rather simple. The Saudis' prior experience with paper money would have revealed it as a dishonest standard. Their long cultural and religious heritage taught them that gold is the ultimate and most honest standard of value. Their long cultural and religious heritage taught them that gold is the ultimate and most honest standard of value. Looks like a loss for the finance ministers and a percieved victory - though horrendously stupid - for Merkel. Tensions between Merkel and Schäuble (German finance minister) have recently exploded over this issue from what I know. Merkel - who I believe deeply misunderstands the situation - wanted the IMF in, while Schäuble relucted to even consider it. However, I'm not sure the deal with the IMF has already been rounded up. Guess we'll have to wait a while to see it confirmed. "A/FOA might not have imagined the US making the oil fields of Iraq their native supply..."
They underestimated the evil and violence that a failed dictatorship like the United States was capable of. why do you think Merkel is misreading the situation. I totally disagree. If anything she is uniquely suited to understand exactly what is happening in the monetary ssytem. Let us not forget she is trained in the "hard" sciences. "She studied physics at the University of Leipzig, earning a doctorate in 1978, and later worked as a chemist at the Central Institute for Physical Chemistry, Academy of Sciences (1978–1990)." The Greek bailout is quite significant for German politics. The German Bundespräsident (president) normally keeps fairly quit about state affairs, but in this case he is beginning to speak. Interestingly enough Horst Köhler has studied economics (and politics) and has also held a high position (Managing Director and Chairman of the Executive Board) in the IMF (2000-2004). Accord to Der Spiegel Köhler is "giving Merkel grades in the same manner a school teacher would, thereby making a mock of Merkel and her entire administration." Köhler has quite some support from the German population. Thereby he could become Merkels no. 1 problem. You might be correct, I believe I was too quick with my judgement. Köhler a per Der Spiegel was also quoted explicitly considering rising oil prices. The IMF or Greece are not mentioned in the article. It appears the IMF has a wedge in the heart of the EU monetary system, and can use it to weaken or strengthen the Euro as it sees fit. Of course someone could that that. The truth is, they are on the same team. Why is this so hard for people to understand? You describe it as a wedge. They would think of it as what do they need to do next to get where they want to go. WS might get wiped out but a more centralized control will emerge in it's place and we will all be like man they bit the dust and one side won. They are good. As big as this fraud is, it is NOT the "biggest". That record falls to the scheme of fiat money coupled with a tax on incomes as measured in nominal currency. This enables theft from all holders of fiat currencies, which happens to be all humanity. "This is the shabby secret of the welfare statists' tirades against gold. Deficit spending is simply a scheme for the confiscation of wealth. Gold stands in the way of this insidious process. It stands as a protector of property rights. "statists' antagonism toward the gold standard."